Gluten free, vegan, paleo, lactose free, all that other dietary health-food waffle - it's just never seemed particularly appealing. Where's the molten, stringy cheese and gooey chocolate at? Don't they understand that refined carbohydrates taste amazing? Chia seeds, activated almonds and raw peanut butter can all be found on the shelves of this health conscious café. Aptly named for its wooden shabby-chic veneer, The Shack is out to change the opinions of heathen minded people like myself with their collection of deliciously fresh and vibrant gluten free and vegetarian dishes. They even stock a selection of desserts and sweet treats that surprisingly taste pretty amazing, despite being gluten free and occasionally vegan, paleo and lactose free as well. 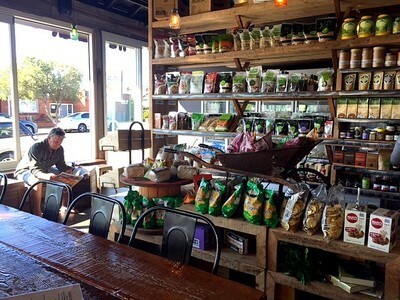 The Shack, in the beachside suburb of Monterey, is half café, half green grocer, half wholefoods store (yes, three halves), the shelves of which are stacked with organic oils, gluten free porridge, spelt pasta, raw spreads and of course, like any good wholefoods store, bags filled with ancient grains, quinoa and chia seeds. 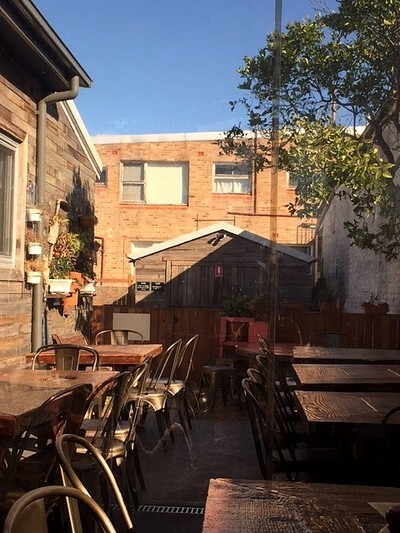 This sunny terrace makes for a great place to enjoy a lazy weekend brekkie. 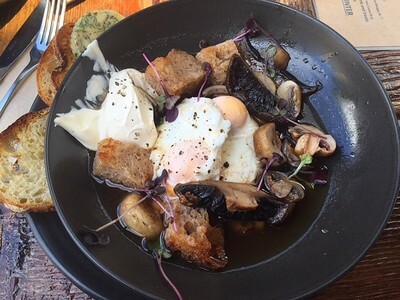 Besides being a wholefoods store, The Shack also serves up a selection of breakfast and lunch options, most of which are vegetarian and already gluten free, or can be made gluten free at your request. Just grab a seat at one of the chunky reclaimed wood tables out on the sunny terrace and peruse the menu, which includes a pretty epic drinks list of smoothies, coffees and teas made with your choice of either almond milk, soy milk,or just regular milk milk. 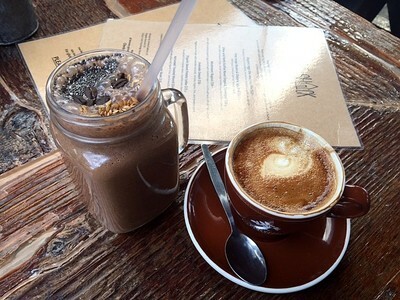 A double shot espresso, banana, coconut milk, cacao, cinnamon, chia and date smoothie - a great start to any morning. Breakfast, which is available from 7am until 3pm, includes breakfast staples like smashed avocado on organic sourdough toast, and eggs. There are a few surprises on the menu however - the mushroom ragout with poached eggs, chunky sourdough and herbed café de Paris butter for example is warm, filling and very satisfying, as are the sweet potato latkes that come with creamy labne and sweet cherry tomatoes. The Shack's unique menu sees more than the usual eggs and toast for breakfast. 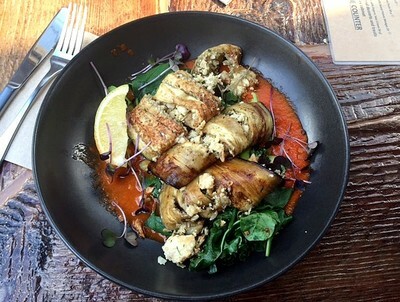 For lunch The Shack serves up organic tofu with cardamom brown rice, and a truly amazing eggplant roulade stuffed with feta, dukkah and almonds, as well as a selection of sandwiches and salads. For those carnivores who literally can't with the 'rabbit food' there is also a chilli and lime steak sandwich served with sweet potato wedges, and a seared lamb fillet available, to name but a few. Vegetables never tasted so good. Most clean eating desserts seem to comprise little more than fruit salad and chia seed pudding, which frankly, for a sweet tooth like mine, simply won't do. The cakes, tarts, biscuits and slices at The Shack however shatter all my preconceived notions of what gluten free, raw and vegan desserts really are with their rich flavours and moist textures. 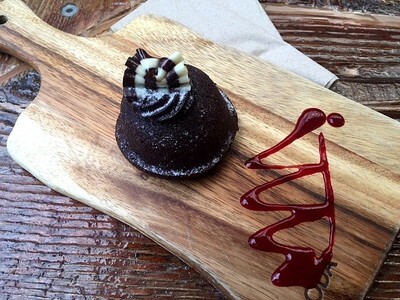 Decadent, indulgent and delicious - it's hard to believe it's gluten free. While I will never part ways with cheese and white bread, The Shack has certainly changed my disposition in regard to gluten free, raw and vegan foods. Not only has The Shack proven that these foods can be delicious, as well as nutritious, but also showcased their versatility and vibrancy through a tasty, well constructed menu that is always changing and updating to highlight the best fresh, seasonal produce. Cost: $6 to $22. Drinks from $4. When: 6am - 6pm Monday to Sunday. Good for kids: Yes, there is a small children's menu available and lots of space for prams. Take away: Coffee, sandwiches and salads.